Professor of Digital Humanities at the University of Trier, Germany, and Co-Director of the Trier Center for Digital Humanities. Also, mentor of the early-career research group Computational Literary Genre Stylistics (CLiGS) at the University of Würzburg, chair of the COST Action Distant Reading for European Literary History, and president of the Digital Humanities Association for the German-speaking area (DHd). Christof studied Romance languages, English and Psychology in Freiburg and Tours. His master’s thesis was on French contemporary writer François Bon (cf. www.tierslivre.net). In 2008, he obtained his PhD in French Literature with a study of La Description double dans le roman des Lumières 1760-1800 (binational programme Kassel / Paris IV-Sorbonne). The thesis has been awarded the Prix Germaine de Stael 2010 and published with Classiques Garnier. From 2004 to 2011, he has been a research assistant at the Institute of Romance Languages and Literatures at Kassel University. 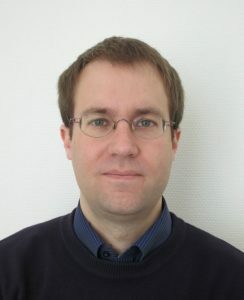 From 2011 to 2017, he has been a research associate at the Department for Literary Computing at University of Würzburg, first as a researcher in the DARIAH-DE (Digital Research Infrastructure for the Arts and Humanities) inititative, then as leader of the Computational Literary Genre Stylistics group. In 2017, he received the offer to join Trier University as Full Professor of Digital Humanities. Christof’s interests in research and teaching are located at the confluence of French literary studies and the digital humanities. His methodological focus is on quantitative methods of text analysis and building of digital textual resources. In terms of materials, he is focusing on French Classical and Enlightenment drama as well as on the modern and contemporary French novel. He is also interested in new forms of scholarly publishing and collaboration and pleads for Open Access to publications and research data. He is an active member of the Romance Studies and Digital Humanities communities.